I have been asked to reflect upon it at my church this Sunday (10-16-16). So I better get some thoughts flowing. Why us and not the Northern Shafted Flicker, or a virus that fractures a tulip in a dazzling array of colors, or a Dogwood Tree? Does God not resemble trees, diseased plants, and Woodpeckers? Thirty years ago I gave a talk on Nuclear Winter in front of fellow biology students and biology professors. I was asked one question: Are you depressed now? I remember my answer: No, because even at our most destructive self, we humans apparently cannot eliminate life on this planet. And 30 years later, might I add: if you leave God a critter or two, God will be use the laws of science to recreate the image of God, which we see as a mirror. 26 For she(Lady Wisdom, Sophia) is a reflection of eternal light, a spotless mirror of the working of God, and an image of his goodness. Creation is a mirror and God's light shines off of it in the most amazing reflection. We see creation when a photon of light enters the lens of our eye and sends an electrical impulse into our brain. All of it. The good, the bad, and the ugly is all creation. We are meant to open our eyes and be moved by what is seen. Don't ignore the good or the bad. Beauty fades. Ugly transforms. Creation is not static. The most beautiful thing we can experience is the mysterious. It is the source of all true art and all science. To whom this emotion is a stranger, who can no longer pause to wonder and stand rapt in awe, is as good as dead: their eyes are closed. which sounds like a fine transition to my most recent post. Then to make an ending in which I motivate all to be like God, be creative. What does it take to change the tides in your life? Once pulled away it takes a shift to bring us back to a place where we were progressing. This summer as we had far less rain than normal, I spoke of the need of a weather event to knock that prevailing dryness for a loop. Apparently my blog needed the same thing and it came one day at my church, when a friend asked me to create a gift for the new Episcopal Bishop for southe east PA. When I pray, awe in the studio, this is it what I mean: When friends and people I have never met, trust that I will create beauty; I am awed. When we are awed by God's presence, a flower, a bird, a piece of music, a meal, or a story; we are called to be aware of how amazing creation is, to be awed." When I am trusted to create a piece of art that will be seen as beautiful, is a gift of trust that I don't want to ever forget. So I keep reminders in my studio to keep me aware that God's presence is there. When someone sees my art on their computer or phone, they may or may not know about the spiritual side of my studio; but my friend has listened to me lead discussions to adults and youth at our church and so he knows me in ways that others may not. He trusted me to not only to be artistic, but also spiritual. The tide shifted. And that is why this commission meant so much to me. And I felt a need to write a post. It was an honor to be asked to create a piece of art to celebrate your visit to Holy Trinity Lansdale. Welcome. When you look at this you may or may not see seven circles, but at one point that is all that was on a piece of paper. The circles represent what I pray each Sunday after I receive the Holy Eucharist. I wrote these down at a silent retreat at The Jesuit Center in Wernersville, PA in 2014. Over time they have not changed, except switching out music for jazz, however, show up on a Sunday when I am setting up coffee and you will hear some jazz. However, I have seen them changed and how they flow from one place into another. My experiences of God in a sunflower help my eyes to see beauty everywhere. A hymn bringing tears to my eyes, only reinforces my desire to play music in my studio. If I try to understand why I wrote down Grace with my friends, I am not sure, but maybe one day it will be clearer. A conversation at a memorial service yesterday seems to be a piece of the picture. And maybe it is the blending of these circles in my life, that shaped the design in front of you. As I listened to Clark Terry play ballads, the circles that I wanted became blurred. It was not my plan, but luckily I let it unfold into what it became. And a thought about the colors: The colors were chosen from memories of a trip to New Mexico in the late 90’s and the landscapes of Cezanne. 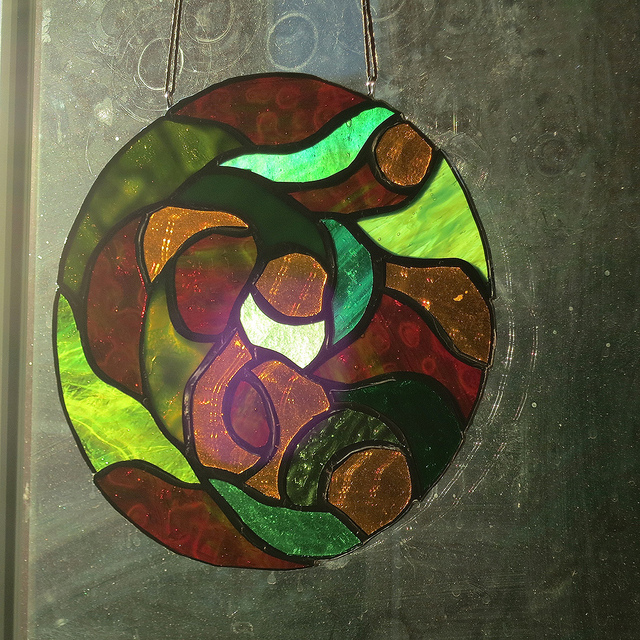 I started with the green and chose a variety to flow through the mandala. That left 14 pieces. Seven for a red created by the Youghiogheny glass company here in PA and a deep amber that took me to NM and Cezanne. Again, welcome to PA. My day job prevents my presence today, but I do hope to meet you in the near future." Only two have not found new homes and they remain in my critter section of my etsy shop along with a couple butterflies and a funky turtle. A few were commissions. The male and female cardinal, although I had started the female cardinal when someone asked if I had ever created a cardinal, but the male cardinal was a commission from the start, as was the hummingbird. I remember the day a hummingbird visited a Hosta bloom, raising their favor in my garden. A couple birds were revisited designs: The Blue Jay and the Goldfinch both chosen for the patterns created by their plumage The Blue Jay was a chance to celebrate a corvid, a rare one with color. The Goldfinch that rare bird that passes up on bird feeders to eat seeds from a variety of my flowers. At the end of the summer opening the front door always meant a burst of gold flying from the sunflowers. And the Great Blue Heron and the American Kestrel were birds I loved that were new designs. I still see herons on a regular basis, in fact one flew over my car as we drove to Margaret's sisters on Christmas. Kestrels are a bird that I saw all the time in the late 70's and early 80's. I hear their numbers are dropping and I can say I rarely see them though I have not moved out of their range. 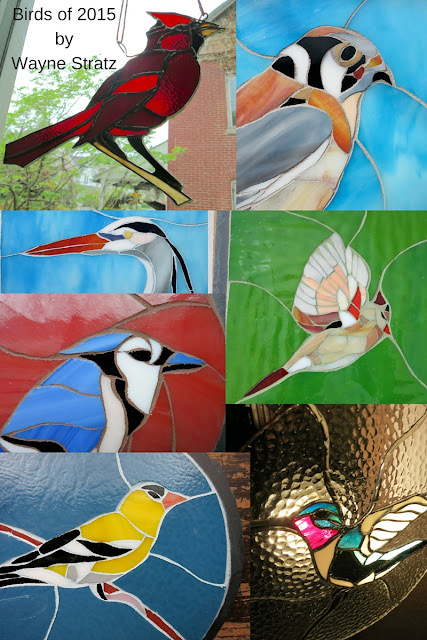 I ended the year creating two more heron mosaics when asked by a friend for one of them. A Wood Duck has been simmering in my mind for months. Maybe this will be the year.